The model ACP981001 armature assembly is ﻿made of stainless steel. ﻿It is designed for piping system, and we provide this machinery parts with AC/DC voltage, NBR sealed and 0-16 bar / 0-240 psi pressure functions to meet various demands from customers worldwide. This standard type armature assembly may physically caused noise of alternating current solenoid operated valves, which can be distrubing. But we've used our professional designed team to reduce this disadvantage as possible as we can. Established in 1986, Jinn Woei has been provided strict production line of armatures to boast exceptional quality and precision for your piping system. Since the armature assembly product is for piping system, the plunger and core are therefore made by a magnetic stainless steel, which is especially designed for solenoid applications. 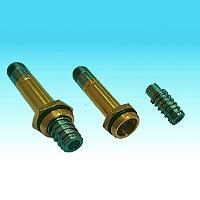 In this system, the guide tube is made with brass while the plunger is normally equipped with NBR rubber seals. With years of experiences, we are confident of providing you the best accessories for your piping system. Please do not hesitate and contact us today or send your inquiry! We are ready to serve you our best products and services. Pressure: 0-16 bar / 0-240 psi.